Oh yes, it feels like 89 degrees and not 93. And if I want to get reeeally optimistic, I will say that today is five to seven degrees “cooler” than yesterday. A wonderful consolation, says my dog who is passed out drooling in the darkest, coolest corner of my bedroom. Please stick me in the fridge where it’s cool and I can be with all my delicious BFFs, namely Mr. Leftover pizza. Anyway, as if I needed a reason to eat cold cereal for dinner, today’s weather will serve as my excuse today. Sooooo there’s an itty bitty 0.6 lb gain. I’m not entirely concerned because 1) I haven’t worked out, thank you hurt calf, and 2) TOM is knocking on my door, thank you cramps for telling me last night. 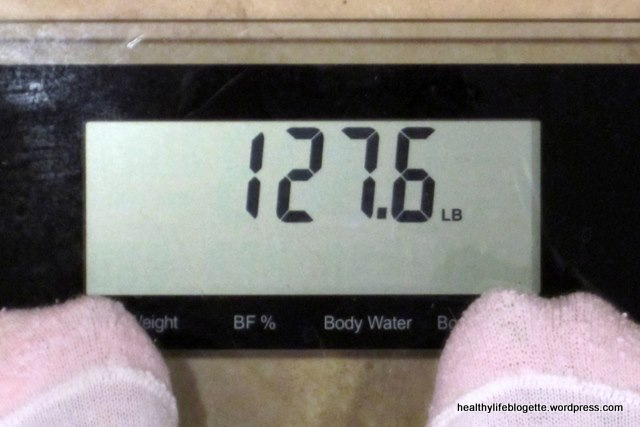 Although… I did step on my scale two hours later for kicks and found it to read 124-something lbs … Hmm. As long as my calf reports continue to be boring from now to Sunday, I’m thinking Monday will be the day I start my workouts up again. I’m feeling it! April was supposed to be all about re-establishing my healthy habits, which went particularly awesome for a grand total of … 10 days-ish, when I realized that I strained my calf. Since then, I rested a whole lot, but continued the eating part at the very least, so April wasn’t a total wash.
>> RESULT: I lost 3.2 lbs and gained 0.6 lbs which made for a total of 2.6 pounds lost. >> RESULT: I recorded everything I ate, but did not restrict calories because… Well, I didn’t feel that I needed to. >> RESULT: Nothing after I hurt my leg. >> RESULT: Done and done! >> RESULT: I managed to drink 100+ oz of water almost every day! On the days I didn’t make my goal, I accounted for my morning tea, which brought me up to my goal. Drinking a ton of water. Food-wise, it helped me to snack only when I’m hungry and to feel more full during meals. Physically, I no longer get headaches and my joints are less cracky. I will definitely continue drinking 100+ oz of water a day. Keeping a food diary. Now, I mentally commit to memory what I eat so I can remember to type it out here, but what it really does is make me review my decision. It is so easy to eat 15 cookies and just forget about it, but with a food diary, I actually need to remember that I ate those cookies! So because of the simple fact that I now record what I eat, I did not commit any mindless eating/choosing this entire month. Not eating any chocolate and pastry items. This was super unofficial goal that I decided to undertake because right before I started this blog, I realized that my consumption of treats was getting out of control. Going cold turkey on the stuff helped me to reset my palate, stop craving sugar, and start wanting fruit instead again. In fact, there’s a BIG batch of chocolate chip cookies sitting on my kitchen counter right now that I have not even touched! Doing too much too soon. I dove into my new workout too quickly and did not give my body enough time to rest. Total rookie mistake! In my head, I am still that person who walks six miles a day and runs 5 miles on a “short” day. When I get back to it, my workouts will be paced much slower with gradual increases. Continue my success in healthy eating. Slowly add in exercise, paying great attention to injury prevention. Weight: Land in the neighborhood of 125-126 lbs. It’s not much, but I’m taking in consideration that I may not be able to work out hard enough to lose weight. If I lose, great! If not, I’ll be happy if I maintain. Food: Eat smaller meals, supplement with snacks if needed. Cardio: Get back into it slowly.